One of the two levels that took me 9 hours to finish. I've had a lot of enthusiastic commenters heaping praise on Legend, so I've done my best to give it a fair shot. But I'm simply not feeling it. Gameplay sessions are mildly torturous, and I have to have something else going on--a television show, a "Great Courses" series, another game--while I play it. The game is far too combat-heavy for a title that gives you so few tactics in combat. Most rooms and most corridors in between rooms feature at least one battle. If you linger too long afterwards, you might even get a second battle. Even after you "clear" a room, there's around a 50% chance of an encounter on a subsequent visit. I started counting the number of battles I fought in the two levels of Fagranc. I lost track at some point, but it was well over 100. There are a few factors that make the combats annoying, and I mostly covered them in my last entry. I suppose in the broadest sense, they're annoying because most of the time, there's nothing for you to do but watch. But just enough of them are dangerous enough that you have to jump to the rescue with a spell, potion or magic item. So you can't just let them start and then go get a snack, but when you do watch them intently, it's like waiting for a pot to boil. A reminder of what combat looks like. As I've reported before, a lack of enemy names or really any differentiation means that you really don't know which combats are going to be dangerous until they start. There's virtually no correlation between the location and the difficulty--random combats in hallways are often more deadly than fixed combats in important rooms. So you end up reloading a lot after you've learned, the hard way, that this combat is one that needs your full attention. Not that "full attention" always saves you. With respect to those that love the spell system, I still don't have a lot of luck except with a healing spell that heals the caster and damage and paralysis spells that target the enemy directly in front of the caster. The utility of something like "Forward-Missile-Surround-Damage" or "Forward-Forward-Forward-Paralysis" is lost in a game where you cannot reliably position or face the characters. By the time I get the caster nudged into the right place, the enemy I wanted to target has moved somewhere else. If there's one positive to the game, it's to be found in the puzzles. I covered a pretty hard one a few entries ago, and I still maintain that it was a little too hard for being so early in the game. Now, I see better how I might have figured out the solution on my own. 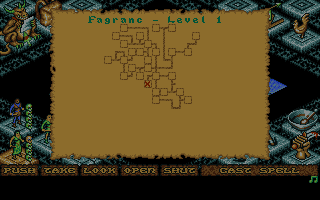 The puzzles in Fagranc weren't nearly as hard, but they were still challenging enough to be fun. 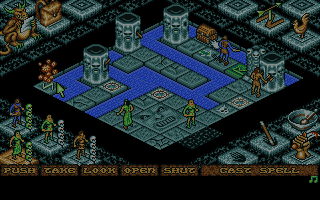 For instance, the screenshot below shows a puzzle where casting "Damage" on the western rune causes the person standing on the square above the face to teleport to the closest pad across the water. If someone is already standing there, he teleports to the other pad on the eastern side. Both pads have levers nearby that raise squares from the water, and the ultimate goal is to get someone over to the chest. Casting a spell at a rune shoots a teleportation spell out of the northwest pillar. I was able to figure this out through testing, and it was a lot of fun, but there were only a couple of puzzles like this in Fagranc. The issue is confused by the fact that a lot of the rooms have floor tiles that look like they're parts of puzzles but really aren't. Trying to get to that chest when there's a teleportation pad in front of it. I think I just cast a "Teleport" spell from a scroll. I don't know if that was the solution or if I just circumvented the puzzle. Some of the rooms are beautifully rendered, and it makes you wish there was more to do than simply search the various pieces of furniture for treasures. As for those treasures, equipment rewards have been frequent enough to count as effective character development. I also find a lot of magic rings (which duplicate spells, but anyone can use them) and potions. I don't really understand potions. Their effects are based on their names--"Serpent" potions always heal; "Moon" potions always make you invisible--so I don't know why they're different colors. I guess maybe the color denotes the strength of the potion? A pretty room, but there's still nothing to do but search. I always like finding Golden Helms, which blast enemies in front of you hard enough to kill most of them. Finding one is the only time I can micro-manage my troubadour. I burn through them pretty fast. I've been experimenting with different troubadour songs, but it's hard to see the effects of most of them. The default, "March of the Bold Ones," which regenerates hit points, is still the most tangibly effective of the group. The two levels of Fagranc, representing about 120 separate room and corridor screens, took me well over 8 hours to fully explore. At the end of Level 2 was a stairway down to a single room on Level 3, full of doors I couldn't open. I found a "Dark Key" in the room along with a note that said "Come and see me at The Dark Tower. 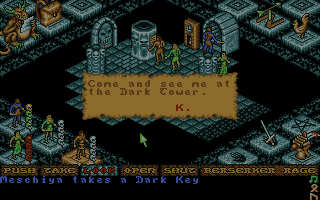 --K." The Dark Tower is in a different dungeon in the northwest of the map. I guess it will be a while before I can report to the king that I've destroyed all the evil in Fagranc. He didn't even want to see me when I returned to his castle later. Sorry, but your evil is in another castle. Back outside, I stopped in several towns to sell my excess equipment and purchase more spell reagents. A bartender told me that The Ancient wanted to see me, which is fine--I needed to visit him to buy more runes anyway. Stopping at various cities, I slowly made my way back to the game's starting area. Beginning the long trek home. In Treihadwyl, I was disappointed that each character could only level-up once or twice. I thought I'd been in Fagranc so long that I was due for a major upgrade. On the other hand, leveling is becoming expensive enough that it's probably a good thing I didn't have many to gain. I wouldn't have been able to afford another round. My berserker and troubadours are now Level 5 and my assassin and runemaster are both Level 4. The experience point variance is significant, from almost 18,000 for my runemaster to about 50,000 for my berserker. The Ancient, meanwhile, wanted me to recover his "mystic staff" from his evil cousin, Kilijan, who lives in the Dark Tower. Good thing I was headed there anyway. I was also able to purchase the "Teleport" rune from him for 4,000 gold, which I hope will get my runemaster out of more life-threatening situations. Of the runes, at this point, I'm only missing "Regeneration," "Vivify," and "Disrupt." "Kilijan" joins the game's long list of names that just don't quite work. I have a few new spells to experiment with, so I suppose I'll give the game another few hours and see what the Dark Tower has to offer. But I suspect you may see me end this one prematurely in favor of making more substantial progress in 1992. You might want to get these runes before returning the staff. I mean, not returning. 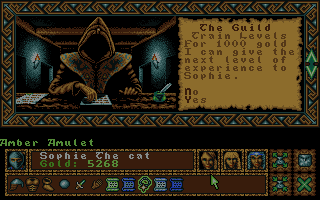 Also, given how much you hate combat here, I wonder how you'll like it in Ultima 7. I didn't like it much in U7, but at least it was over a lot faster. Plus, spells in U7 are a bit easier to target. U7 has some of the worst combat in any RPG... but fortunately it's really easy if you spend any time building up your party's equipment risk-free in towns and castles. Last time I played through I set the whole party to autocombat and I think I only had trouble with a single combat towards the end of the game. The combat in Baldurs Gate drove me nuts, too. Real-time combat and party RPGs don't mix well, at least not for me. I think there's a big difference between real time with active pause and real time without it. Real-time combat can still be confusing at first, even with a pause function, but you don't have Legend's issue of coordinating characters. Pause only helps so much. In real time combat everyone still acts at the same time. So, especially in a tight and crowded environment as in a dungeon, you have to pause and adjust all the time. I never enjoyed that - add bad pathfinding and it becomes annoying. Dungeon Master-like real time combat doesn't have this problem, of course. @VK Yeah, it's not an active pause though. I haven't played Legend, but I understand that when you pauze the game, you can only finish an action that you have already started (e.g. select a target for a spell that has been cast). If that is indeed how it works, it's very different than the pauze system in Baldur's Gate. In BG you can pauze the game, select actions for every party member (walk this way, cast that spell, attack this enemy, …), unpauze, watch how things unfold and pauze again at any moment to adjust. Better yet, the game allows you to adjust settings so the game will be pauzed automatically at specific moments (whenever you encounter an enemy, at the start of every combat round - yes, it's real-time, but it uses rounds - or never at all if you want to play like that). 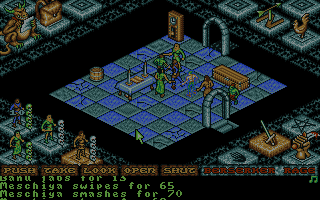 BG's combat always felt very tactical to me, thanks largely to the excellent pauze mechanism. From what I've read so far, Legend's combat is completely different, and not really good. It makes me wonder what the developers would have done if this game had been published when the internet was widely available, with all the possibilities to give direct feedback to the devs and the easy distribution of patches and mods. This game's magic system deserves a better combat system. You are correct about the way it works in Legend, Didier. It is hugely different in the Infinity Engine games, and I agree with your assessment of the tactical nature of IE combats. I'm not saying it's not tactical. Real time with real pause (RTWRP) makes it possible to micromanage movement even for many characters. I just don't want to do that. To me, an action point based system (ideally with interrupts) seems a much better choice for party RPGs. Unfortunately, with RTS games coming up strong in the 90s, suddenly everything hat to be real time. Legend and Darklands still predate that trend, though. 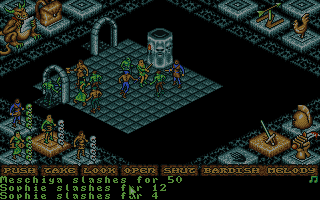 Ultima 7 to me was like a mob attack... you turned on combat mode and your biggest issue was trying to hit enemies without hitting your own party members with clicks. Area effect damage spells were RIGHT out unless you deliberately turned all your companions to passive mode so they didn't run right into it. Also, at one point, Jaana DROPPED her backpack full of stuff and I couldn't find it afterwards, which was really annoying. Can you drop a character's backpack in Ultima7? You can certainly drop containers but I thought the backpack was a fixed inventory space. Characters will drop weapons and run away when feared. In Ultima 7, backpacks aren't fixed. I believe what happened was I tried to equip Jaana WITH a backpack, and it somehow ended up in her hand instead, and thus she dropped it while fleeing in terror. 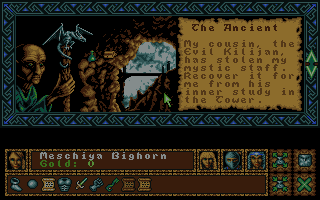 The guys who wrote this also did Bloodwych, another game that you didn't see through to the end. Not a good strike rate for them! Both games are fundamentally too long, with not enough exciting happening along the way. Yikes! How many dungeons are in this game anyway? Many more to come. The game is not going to change significantly, so it's better to quit now or keep on going until the bitter end. 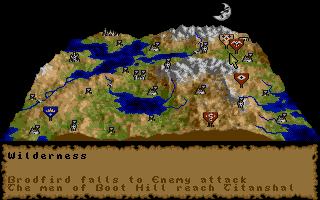 I'd admit that battles in Legend can be pretty tedious, but in my opinion, that goes for quite a lot of old-school RPGs, and I didn't think Legend to be dramatically more so. Magic is most useful in puzzle-solving, but I recall having lots of dispel/stun-type magics, as well as healing, worked best for me. Runemaster requires less XP to level up? This is one of the few (if not the only one) that doesn't penalize spellcasters. The runemaster is level 4 while the berserker is level 5. I think this is the standard situation where melee racks up kills and xp and outlevels spellcasters. With real time combat being the weakest point of the game, I wonder if this is one of those cases where my teenage self would have been better at (and enjoyed more of) this game. 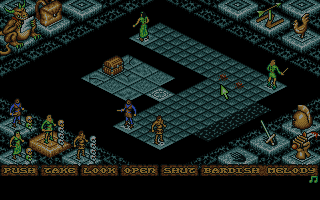 I still think this has the best puzzle and magical systems of any RPG, but perhaps at the age of 40 quickly clicking around to control 4 characters in a chaotic battleground wouldn't be as accurate as when I was younger. I vaguely remember it was imperial to make use of each characters strong points during combat. This would often mean rushing in the berserker who'd get surrounded. The runecaster could cast a missile-continuous-regeneration on his square so he'd be able to hold that spot attacked by all sides. The assassin could then move in to pick from behind any enemies attacking the berserker. The troubadour would keep middle ground, playing his armor tune and covering any stray mobs who could be heading for the runecaster. In a game without any RTwP features, this nowadays sounds daunting to the point I almost feel like giving the game another try to see how I'd do. Those kinds of tactics sound theoretically possible, but I feel they evaporate swiftly in this game with the inability to keep the characters in any kind of formation, the unpredictable room layouts, the poor pathfinding, and the ability for enemies to enter the room behind you. No matter how carefully I try to plan, combat becomes a chaotic free-for-all within a few seconds. At best, I can concentrate on one character in combat and try to position him to use his most powerful magic item. Also on another sidenote: the game can probably be enjoyed more by making combat a non-issue. And this can be accomplished by many means. The most simple would be (I know this probably goes against Chet rules, but...) by hex-editing all Luck scores to 99 or hex-editing a ludicrous amount of money to the party to ensure they can go to any dungeon with 99 Luck, which makes them virtually immortal. That might make the game faster, but I don't see how it would make it more enjoyable since you'd just have to sit there staring at the screen as the combats fought themselves. Anyway, yes--against my rules. Not every game is for everyone - and the addict is literally the last person on earth one could accuse of not trying enough. "Yes, thanks to trailblazers like the Addict. You might say he was a pioneer." "Yeah...you might even say he was an American hero!"